"This is a fabulous smoothie. Mango, orange, and peach juice blend can be used in place of orange juice." 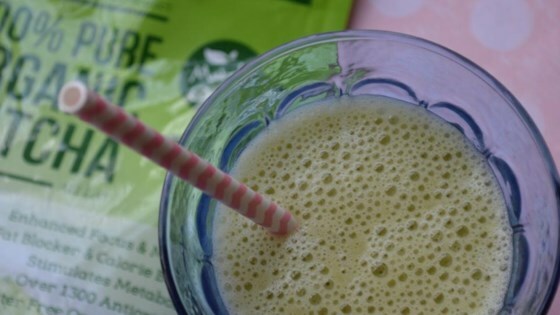 Blend ice cubes, orange juice, banana, and matcha powder together in a blender until smooth. I think that maybe adding more fruits like peaces, mangoes, strawberries,etc. would have a huge and wonderful affect on the smoothie. It's just a little too plain for my taste. I added dates and a little flax milk to break up the icy texture from the cup of ice. Flavor was different but not bad.. Next time I'll try a different OJ. I added an extra third banana, found the flavour a little to plain. Not bad but think I will add some strawberry, mango, or pineapple next time as suggested in a previous comment.